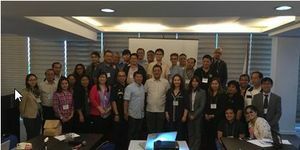 As follow-up activity to the Pre-Disaster Recovery Plan (PDRP) developed by the City Government of Makati in October 2013, the International Recovery Platform/Asian Disaster Reduction Center (IRP/ADRC) facilitated a Workshop on Continuity Planning for Local Governments at St. Giles Hotel, 25 November 2016, Makati City, Philippines. Along with UNISDR-GETI, the IRP/ADRC introduced a continuity planning tool that will help: (i) ensure that local government can perform its essential functions under all conditions; (ii) reduce the loss of life and minimize property damage and loss; (iii) execute a successful order of succession with accompanying authorities in the event a disruption renders that organization's leadership unable, unavailable, or incapable of assuming and performing their authorities and responsibilities of office; (iv) reduce or mitigate disruptions to operations; and (v) ensure that there are facilities from where the city government can perform its essential functions. About 75 personnel, representing various departments of the city government, participated in the workshop. To complement the continuity planning tool, sharing of business continuity planning (BCP) experiences from various local organizations in the Philippines were presented. The sharing included those from the Metro Manila Development Authority (MMDA), Nestle Philippines, PricewaterhouseCoopers (PwC), San Juan City Government, Philippine Disaster Resilience Foundation (PDRF), and Business Continuity Managers Association of the Philippines (BCMAP). After various inputs, participants identified the key priorities to be covered in the continuity plan for the Makati City Government. This includes setting up remote facility from where the city government's Disaster Risk Reduction Management Office (DRRMO) can operate its essential functions in case the city will be severely impacted by disasters. The participants also gave priority in outlining a definitive procedure for executing a successful order of succession whenever the head is incapable. To forward the recommendations reached at the workshop, the city's DRRMO officials along with the representatives of all departments of the city government will reconvene sometime in March 2017 to review its progress and to further discuss the finalization of the Makati City Continuity Plan.